Alex Gardega said he wanted to make a statement about Mr Madoff, who is accused of taking $50 billion (£33 billion) from investors in his fund. Bottles of the sauce, available for sale at $10 each on Mr Gardega's website, bear a photograph of the financier with horns on his head and dollar signs for eyes. 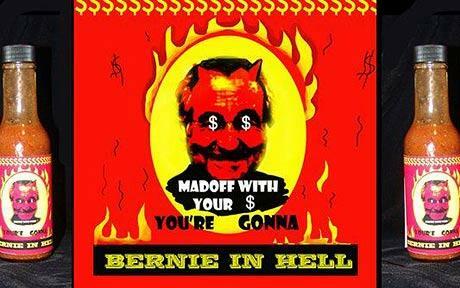 Underneath is the slogan "You're Gonna" over some flames and the words "Bernie in Hell". "This sauce is habenero based and very good and hellishly hot!" Mr Gardega wrote on his blog. Despite his claims of culinary excellence, however, Mr Gardega said the bottles had been produced as a limited-edition artwork rather than as a condiment. More text on the bottle reads, "You can take the money but can you take... the heat?!!!" A string of high-profile names have emerged as victims of the alleged fraudster, including pioneer hedge fund manager Michael Steinhardt, Hollywood actor Kevin Bacon and Liliane Bettencourt, heiress to the L'Oreal fortune. Mr Madoff, who spent Christmas under nightly house arrest after failing to find the four people needed to guarantee his $10m bail, was charged last month by federal prosecutors with directing an alleged Ponzi scheme through his New York investment firm. His lawyer, Ira Sorkin, has said Mr Madoff's company is co-operating with the government.